Take one territorial Chaffinch, a cottage in the Scottish Highlands and some persistence…the result is this little bird, in a big pose that’s normally over in the blink of an eye. I kid you not, this photo is the end result of watching a pair of Chaffinch spend all day long flying from a tree in the cottage garden to one of the cottage windows, where it would fly up and down the window trying to peck and claw at it’s own reflection before flying back to the tree – only to repeat the process all over again! As the sun would track round the cottage during the day they would move round the house…attacking one of the bedroom windows, followed by the kitchen, then the living room! 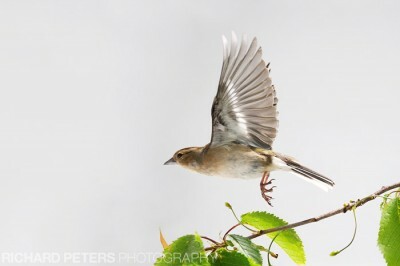 The image I wanted was of the Chaffinch in flight, side on, just as it had come off of one of the tree branches. I knew I had to get outside so that I could shoot against the white wall of the cottage and also to help give me a chance of freezing the action and getting the bird sharp. So, I set about going round the side of the cottage and making my way slowly towards the tree the birds were perching on. I kept low and moved very very slowly and kept checking through the camera to see how big in the frame the Chaffinch was. I knew I couldn’t push my luck so as soon as they were big enough in the frame I stopped and set myself up, all the time trying to be as quiet and slow in my movements as I could. I knew they were fairly tolerant of people as they quite often sat around in the garden as we would walk past on our way in and out, but I still didn’t want to take any chances. Anticipating the moment…and the speed! Now, once I was outside and shooting side on something became very apparent to me…I knew these little birds were fast but when they are flying out of frame and not straight towards you, the speed is incredible and very very hard to catch on camera. In the end I was having to pre empt the moment of take off as waiting for it THEN firing the shutter resulted in the bird being half out the frame in the first shot and gone in the second – and that’s shooting at 9fps! My technique worked although it took quite a few attempts. If you can picture it…I was firing the camera just before I ‘thought’ the bird was about to take off and hoping that it would do so in the middle of my burst of shots. At 9fps and with the standard D3 buffer size though that’s only 2 seconds of shooting, so I got a LOT of shots of the bird just sitting there doing nothing! One of my friends who had been taking shots with me inside the house thought I was crazy when I went outside and refused to budge. I knew if I was persistent it would pay off and I would get the shot I wanted, it was one of those times you can just feel there is a photo in the making and if you just stick with it, you’ll get it. After many attempts and deleted images (I took just over 2000 in total over the space of about an hour) I finally got a shot that froze the action, had the bird fully in frame, within the shallow DOF, no other distracting branches and in a good pose!